Avda Bon Temps s/n, 07560 Cala Millor, Spanje. A family establisment that offers 193 confortable rooms and an ample garden area. Found in the Cala Millor Bay and only a few metres from the beach, the comercial center and the promenade. The atmosphere and guest treatment in this hotel will increase the enjoyment of your stay. This establishment is located in San Lorenzo and is just 150 metres away from the Cala Millor Beach, a well known Tourist resort, Calla Millor, in ancient times, was a hideout for pirates and Arabs because of its easy accessibility and pleasant climate. 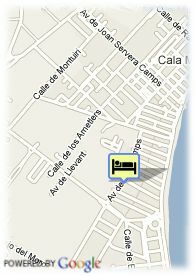 An Aparthotel located in a tranquil area only a few metres from the beach and the Cala Millor promenade.